It’s December and that means one thing: It’s cookie season! As a kid, the holidays in our house were all about food – mostly baking. I remember my grandmother getting out the pizzelle iron to crank out piles of the lacy, crunchy Italian cookies. My mom started a tradition of making all sorts of chocolate treats – Christmas Crunch (better known as mint chocolate bark to most people), chocolate covered pretzels, and even a thin mint-like cookie that is incredibly easy to make and incredibly addictive. And then on top of all of that, we’d bake cookies. Dozens and dozens of cookies. Some were for us to eat, most were to give away as gifts. Now, it doesn’t feel like the holiday season to me unless there are dozens and dozens of cookies around. 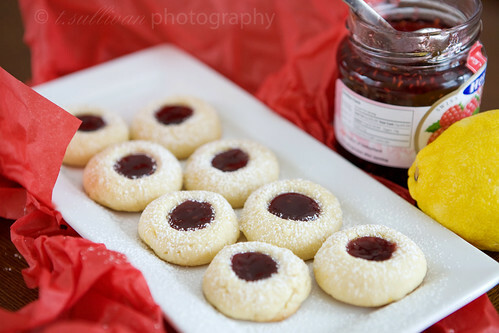 This year I have plans to bake a lot of my own cookies, starting with these lemon raspberry thumbprint cookies. These cookies are always a big hit at the holidays. (They’re also good for breakfast, but don’t tell anyone I said that!) The base is a lemon flavored buttery cookie that just melts in your mouth. In the center, a dollop of raspberry jam gives each bite a little zing. They’ve become a must-have item at our holiday gatherings and they’re the first cookies to disappear year after year. Preheat oven to 350°F. Lightly grease two baking sheets, or line with Silpats. Combine flour, baking powder and salt in a medium bowl. Whisk to blend. Place butter and sugar in the large bowl of an electric mixer, and beat until light and creamy. Add egg yolks, lemon zest, lemon juice and vanilla. Beat to combine. Add the flour mixture in two parts, beating between additions, until moist clumps form. Gather dough into a ball. Pinch off about a tablespoon of dough and roll into a ball. Place about 2 inches apart on prepared baking sheets. Using a floured thumb, make a shallow indentation in the center of each ball. Bake at 350°F for 10 minutes. While the cookies bake, measure jam into a small, heatproof bowl and microwave in 10 second intervals until stirrable and smooth. After 10 minutes, remove half-baked cookies from oven. Working quickly, reshape the center indentations using the back of a 1/2 teaspoon measuring spoon. Dollop 1/2 teaspoon of jam into the center of each cookie. Return cookies to the oven to bake another 10 minutes, or until light golden brown. Remove cookies from oven and transfer to racks to cool completely. These look delicious! I love the lemon and raspberry combo….yum! Quick question….Do they get soggy if they sit for to long? 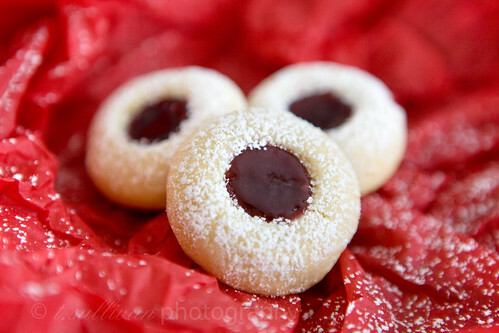 I’m only asking because I have always wanted to do a jam thumbprint cookie for my Christmas cookie tray but I’m worried they will get soggy if I make them to far in advance. these are my FAVORITE cookie. I made them yesterday! The past two years they have turned out prefect, but for some reason yesterday they spread and half of the cookies were giant pools of jam. it was weird, they still taste good though! These are my favorite kind of cookie, but I’ve never tried them with lemon. Sounds delicious and yours look beautiful! These look like perfect holiday jewels. I love the wrapping paper being used in the photos too. Great job! Wowzers. I just made these cookies and they are AMAZING. Seriously, my new favorite cookie!! I had to work with what I had on hand so used orange juice and zest instead and then did half with blueberry preserves and the other half with strawberry…next time I want to try it like yours. Thanks so much for the recipe…I’m new to your site and I love it!